I’ve spent much of my day bathing in the ebullience of my facebook and twitter pages. 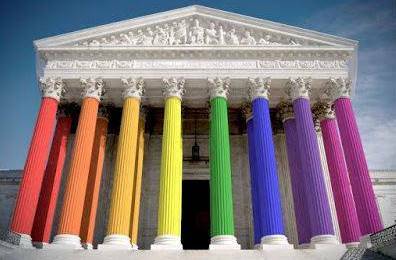 Shortly after the SCOTUS decision was announced, rainbows and kissing couples and heartfelt reactions were everywhere. I smiled, I laughed, I cried a little. Tears of joy mostly. There were a few tears, too, for the men and women who were shut out of their partner’s hospital room or funeral, whose children were taken from them, whose families were ignored or torn apart because they had no legal protections. I’m reminded that the fight isn’t over. There is still racism and homophobia and classism and xenophobia and hate in so many forms. There is an eerie silence from many of my family and friends that I know is covering up distaste, or worse. But in spite of all that, or perhaps even because of it, I celebrate today. Because whether or not marriage is of personal importance to you, it is a big deal. Symbolically and legally, it is life-changing for thousands of couples and families. It’s also a big deal because victories lift us up and give us hope. They replenish our souls an give us the heart and the stamina to continue fighting for equality and justice. For ourselves and for those without a voice, those who live in fear. So today I celebrate. I celebrate the couples lining up for marriage licenses and those whose marriages will finally be recognized. I celebrate the health insurance and hospital visitation and Social Security benefits that will be accessible. I celebrate feeling safer when I head to Louisiana next month. I also celebrate the fact that we have something to celebrate. Even when there is work still to do, that’s something we should never take for granted.